A scenic hour and a half drive from Austin, Longhorn Caverns makes a great day trip to one of the most beautiful underground hikes in the Texas hill country. 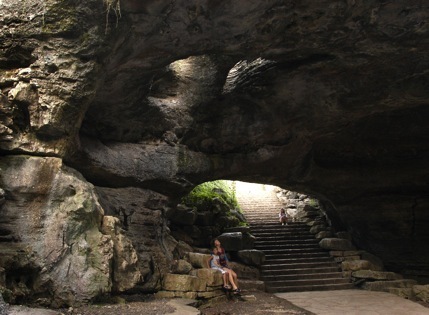 Tour guides spin geology, history and Texas legend into educational, entertaining tours as they lead groups past impressive rock formations, through a crystal-lined cave with walls that sparkle, into an Indian Council Room and through large, open spaces formed by a river and layered in history. The entire tour covers one and a quarter miles and takes just under an hour and a half. An added bonus at this time of year - the tours below ground are nice and cool! The Civil Conservation Corp (CCC) began work on the cavern in the 1930s, working for just a dollar a day during the Depression. The limestone cleared from the cave was hauled out and used to construct the CCC Museum, the Officers Quarters and the Observation Tower located on the grounds. The craftsmanship of the buildings and trails in this natural setting makes it an impressive sight. You can wander the short hiking trails or picnic in the park. If you’d like to further explore the area, Inks Lake State Park is just six miles up Park Road 4 where you can picnic, hike, swim, camp, or rent paddleboats and canoes. On your way, you’ll pass Perissos Vineyard and Winery that opens their tasting room (and picnic tables beneath oak trees) every Thursday - Sunday from noon to 5 p.m. If you’re coming from South Austin, you might stop for a bite in Marble Falls at one of the many restaurants overlooking the lake or across the highway at the famous Bluebonnet Café.